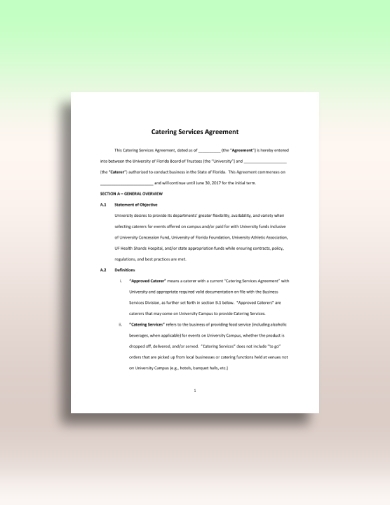 Before performing services related to your catering agreement, it is best if you will put that agreement into writing, which is known as catering contract. 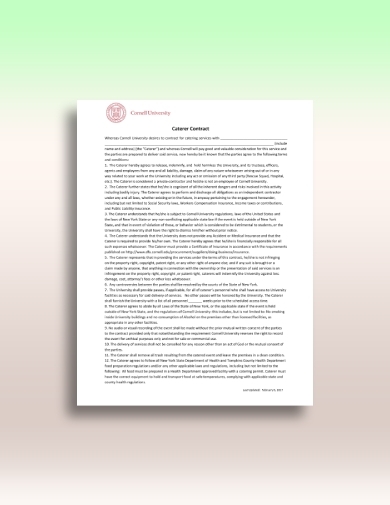 This contract is important not only because it is enforceable in court but also because it provides a general understanding of the subject matter, the goods or services to be exchanged, and the things to be expected by both parties. 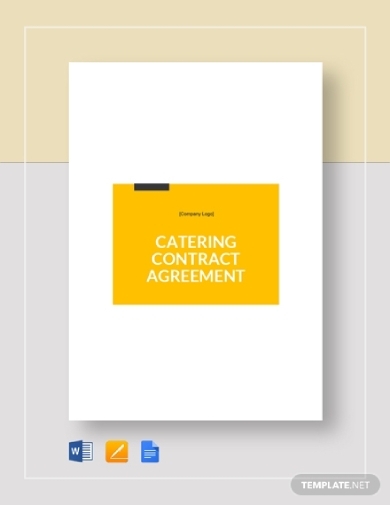 In order to help you draft a comprehensible catering contract with ease, provided below is a guide on how to write a catering contract as well as templates and examples that will enlighten you more on what to include in a contract. Here are some useful steps on how to effectively write a catering contract. 1. Write the whereas statement. The whereas statement must be the first and opening paragraph of your catering contract which contains the general subject and the names and address of the parties of the contract. This may not be a must, but it is very useful in providing the subject matter of the contract as it explains the goods and services to be exchanged as well as the things the parties can expect. 2. List the items that you want to cover. Typically, the list of items contained in a catering contract includes the following: the full legal name of the catering company and the name of the client, the date of the issuance of the contract or the date of validity, the list and brief description of the services to be provided, the menu, terms and methods of payment, and cancellation fees. You must also include the location where the catering service will be provided as well as the expected number of guests. 3. Present the amount of deposit and date of reservation. It is important that the client must understand that after the reservation, you are now locking that schedule for him or her, hence anyone else will not be able to book that date. Because of this, there is usually a 50% reservation deposit. Moreover, the total amount of payment must also be stated, and there must be a clear understanding between the parties regarding the terms of payment. 4. 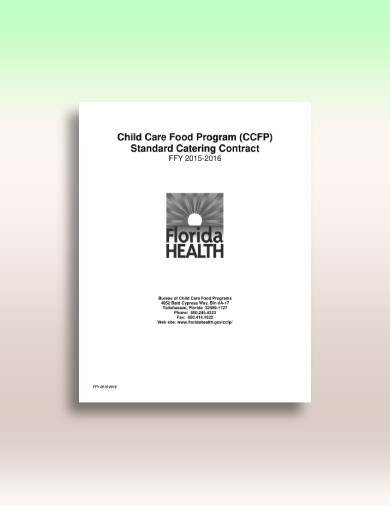 Include the necessary information regarding the policies of your catering company. The policies included may differ from one catering company to another, but typically, it contains the following items: clear cancellation policy, in which the company may give a flexible refund depending on how early the cancellation is made; liability policy, which states who will be responsible for any damage to the rented property or loss caused by the guests at the event; and leftover policy, which clearly states who will own the leftover when the event is over. 5. Write down the procedures in case of breach of contract. Do not forget to write down the exact procedures for any breach of contract and the provisions on what constitutes a breach of contract. Both parties must know and understand who will be responsible for legal fees or other procedures in case of breach of contract. 6. Write a paragraph that states your guarantee for quality services. Close the document by including a paragraph stating that you guarantee the client with quality service. You can also leave your contact information in case the client needs to communicate with you regarding further questions, additional bookings or reservations, and other related concerns. 7. 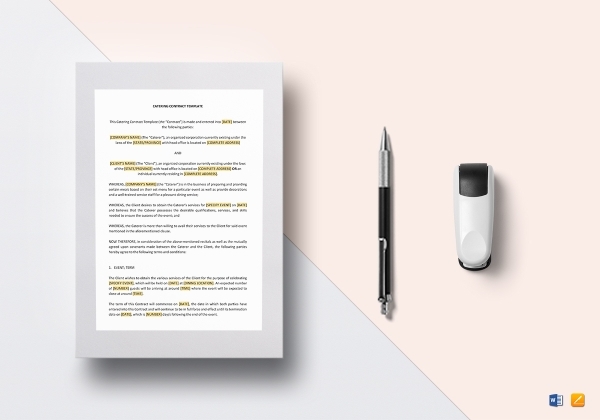 Create a signature section at the bottom of the contract. Lastly, create a signature section at the bottom of the page with a space for the signatures of the client and caterer, the position of the signatories, and the date of the issuance of the contract. 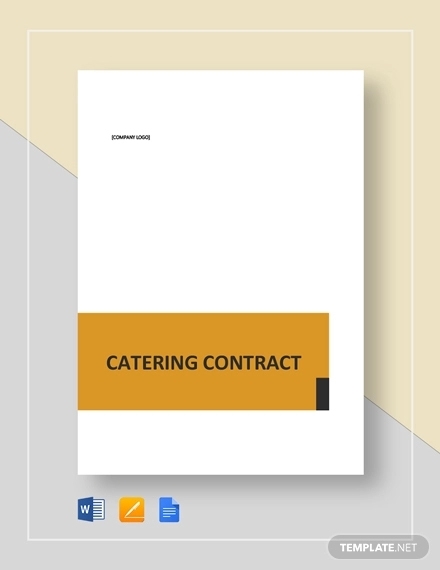 With this simple catering contract, it is guaranteed that you can immediately create a contract with ease as this is available in different file formats, namely Google Docs, MS Word, and Pages. It is created professionally and contains an outline or draft of the provisions related to your catering agreement. All you need to do is edit the template and personalize it as your own. 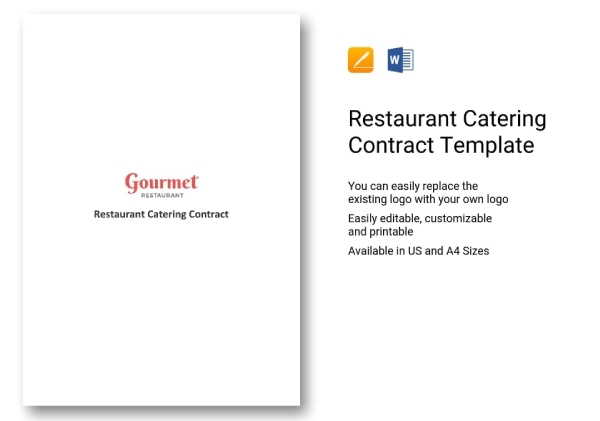 Now that you know what are the important matters to be covered in your catering contract, it is essential that you organize them in a document with the use of this restaurant catering contract template. With this, you will become clear in your stipulations and you will be certain that you relay the terms and conditions in your catering well. Never miss out the opportunity of providing good services to a good client with the help of this professional catering contract template. This is easy to download and has an editable feature which makes it convenient for every user. Need to create a catering contract in an instant? 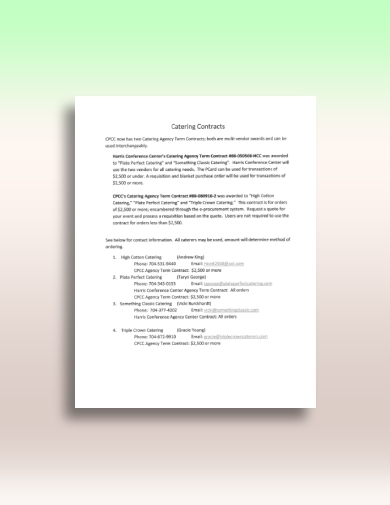 Check out this one-page catering contract example, which contains a brief, yet complete, list of all the provisions needed to be included in the contract, such as the name of the parties, contact information of the caterer, price of the services, and different catering services available. Because schools often need the service of a catering company, it must have a catering contract, such as the one presented above. It must clearly state the type of catering service needed, the policies regarding risks and hazards, insurance, food preparation, health regulations, and breach of contract. 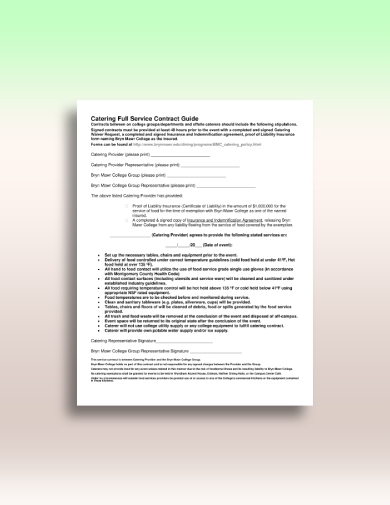 In this catering full service contract example, apart from the typical items listed above, it also contains information as regards the setting up of table and chairs, delivery of food, method of sanitizing, food waste, and water supply. At the bottom of the page, a disclaimer statement can be found regarding risk of foodborne sickness, among others. It is common for a catering company to also provide for the venue of the event as part of the package of the catering contract. 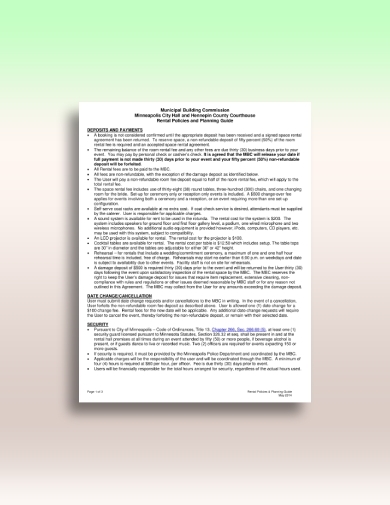 In this case, you can write a catering and venue rental contract, similar to this example. It must have a stipulation regarding the deposits and payments, date change or cancellation, security, catering services, alcohol, decorations and entertainment, and other related to the service agreement. 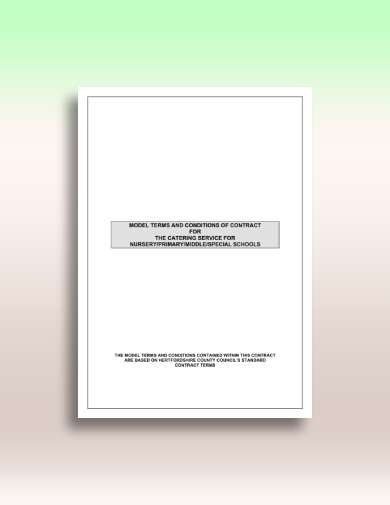 This standard catering contract example contains a comprehensive discussion regarding the following: scope of work, contract price, amendments, selection of the event menu, special conditions, emergency requirement, termination and renewal, conflict of interest, geographic preference, mandatory participation, regulatory compliance, and many others. The demand for catering is high not just in events attended by adults but also in nursery and primary schools. Hence, when you encounter such clients, you can refer to this contract template for you to have a guide on what to include in the contract. Basically, the following items are included: general provisions, financial arrangements, control of the contract, insurance and liability, termination of the contract, disputes and law, and statutory obligations and conditions. Every detail of your catering contract must be specified in order for both parties to fully understand the contract and to avoid disputes and conflicts in the future. You can refer to this detailed catering contract on what are the items that must be present in your contract for it to be complete and comprehensible.